And the fourth gift? A stamp pad! Found this neat stop motion short about making cookies via Photoshop--very cute! I generally love any crossover between baking and nerdiness, and this one is spot-on adorable. I should have planted an herb garden years ago. Because I cook a lot--usually six days a week. Because I love fresh herbs. And because those little boxes of fresh herbs from the produce section mean you're consuming plastic (even if you recycle, somebody had to make that plastic, man). And finally, because whether you buy the herbs at the grocery store in little jewel boxes or from the farmers' market tied with organic 100 percent little rubber bands, fresh herbs cost a LOT! I could have saved enough for a plane ticket to England if I'd planted an herb garden years ago. Umm, okay, it's a bunch of mismatched pots on a patio table, but it makes sense, people! The pots are all things I had sitting around in the garage, so they cost nothing. The "garden" is on the patio table because if I planted the herbs in the ground, or even set the pots on the patio, I'd have pugs chomping on herbs. And pugs...doing worse things to herbs. The "garden" is located on the patio table because herbs need tons of sunlight, and this spot gets so much sun all day long that even roses get faint from all the sunshine. The herbs are gonna love it here. and--uh-oh; I forget! Is that marjoram? Now, if the herbs will grow half as well as this Oxalis, I'll be a happy camper. I'm a champion Oxalis grower. Too bad it's a weed. More great polka dot fashions in the March 2010 issue of "O" magazine! I'm seriously considering tracking down the sleeveless blouse with the tie at the waist. These plums are sweet on their own, so I like to pair them with the savory herbal qualities of thyme. 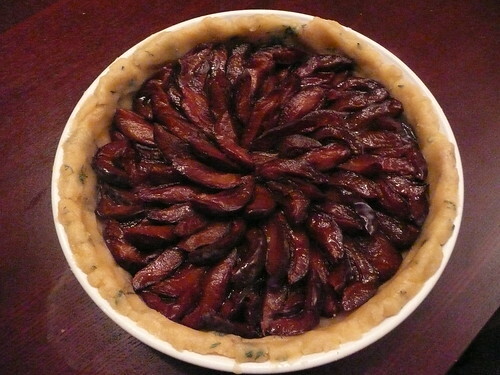 It's an interesting combination, but not so strange as to turn someone off from enjoying this delicious tart. 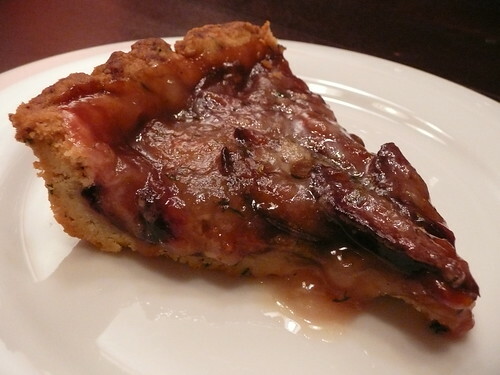 This crust is tender and crumbly, the plums get slightly caramelized and gooey, and the top has just a hint of crunch. It's rich and sweet but light enough to be enjoyed after a filling meal. Start by making your tart dough, adding a generous amount of thyme. 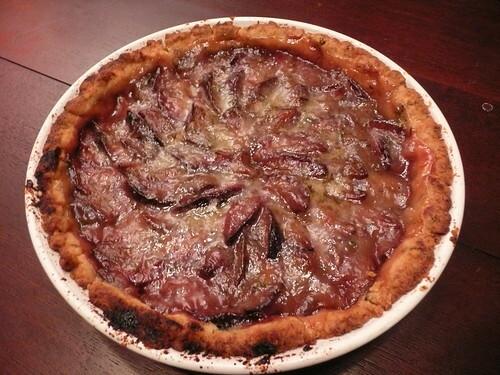 Pat the crust into a tart pan and layer quartered plums in concentric circles. ...and bake until golden and bubbly. Let cool as long as you can stand, and dig in! Heat the oven to 425 degrees. In a bowl, stir together crust dry ingredients: flour, salt, sugar, and thyme. In a small bowl, whisk together the oils and milk. Pour this mixture into the flour mixture and mix gently with a fork, just enough to dampen; do not overwork it. Pat the dough into the bottom of the pan, pushing it up the sides to the edge of the pan. Arrange the plums overlapping in concentric circles; they should fit snugly. In a bowl, combine filling ingredients: sugar, flour, salt, thyme, and butter. Using your fingertips, pinch the butter into the dry ingredients until crumbly, with a mixture of fine granules and tiny pebbles. 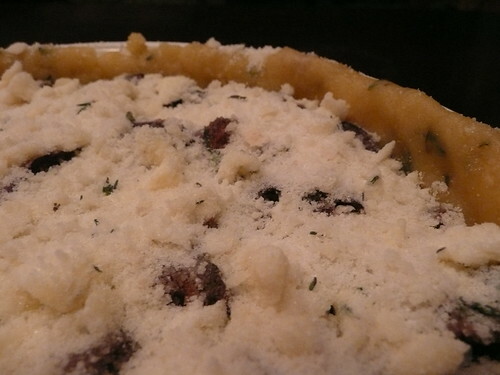 Sprinkle the pebbly butter mixture over the top of the tart. Bake for 35 to 45 minutes, until shiny, thick bubbles begin enveloping the fruit and the crust is a nut brown. Cool on a rack. Serve warm or at room temperature. When I was a little girl in the 1950s and early 1960s, the world was a far safer place. 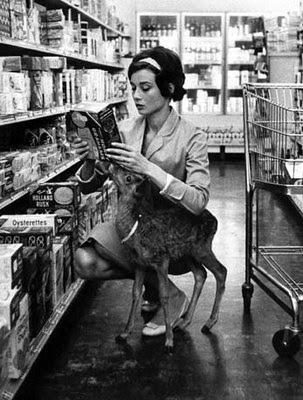 I remember going to the grocery store with my mother and, while she shopped inside, I played in the front of the store. Right next to doors leading out to the parking lot. With no attendant around, no nothing. People parked their cars in the parking lot, then they parked their kids in the kiddie area. It was a special place, set aside for children to play while their mothers shopped. 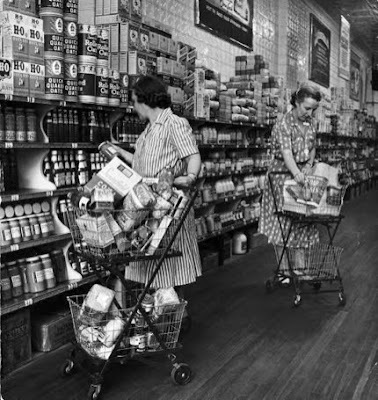 And it was always mothers doing the shopping, because this was the 1950s/early 1960s, people. Even better, there was a little booth you could sit in and watch cartoons, for free! It was about the size of a novelty-photo booth--you know, the kind with the little half-curtain across it, just enough room on the bench for you and a friend, the kind that gives you a strip of four photos at the end? But this was a booth to sit in and watch cartoons, which were on a continuous loop. After I tired of riding the rocket ship or the bucking bronco or whatever, I sidled into the cartoon booth and stayed there, happily soaking up cartoons until Mom finished her shopping. It is astonishing to think how naive we as a nation were, back then. Moms assumed kids would stay put in the kids' area. Kids assumed moms would come back for them (a pretty safe assumption on my part, since I was a good little girl). 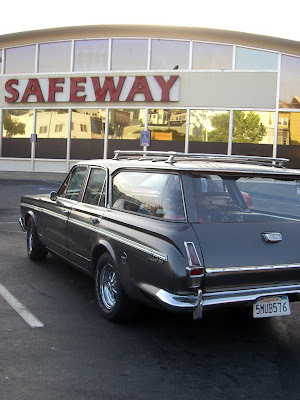 Grocery stores assumed they had no need to establish a check-in/check-out system for the kids. They further assumed no need to employ an adult to watch over said kids. Everyone--moms, store owners, society, the government--assumed there was no reason why the area shouldn't be right at the front doors of the grocery store. Right next to the parking lot filled with moving cars. Right where anybody could come in, grab a kid, and be gone before the child could even bleat, "Hey! I'm missing the Mighty Mouse cartoon! Unhand me, you creep!" I want to bring the idea back. Not for kids, actually: for dogs. There's a lovely grocery store, with the most wonderful produce, just a 7-minute walk from my house. I tend to shop in the European method--that is, I buy something almost every day to make for dinner that night. I would love to be able to walk a dog or two over to the store, tether them up safely, get my fresh parsley or pound of green beans or whatever it is I'm missing for dinner that night, and then trot home with dog and single bag of groceries. We'd have to make a few changes from the 1950s model, of course. We'd need a way of checking the dogs in, having somebody watch over them, and a safe system of reclaiming them that doesn't allow for some creep to take your precious Fifi home, hoodwinking the attendant into thinking it's Creep's, not your, dog. IKEA does it. Near the entrance to the store, there's a kid zone. Children are checked in, and off they go to play. While parents shop for "Ikvor" book cases and "Lubland" lamps (making up these names, folks--doesn't IKEA? 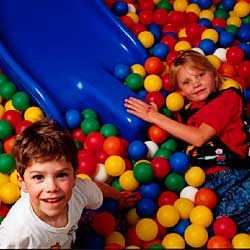 ), the kids happily play in the ball pit, color, read books, stack foam blocks, whatever. 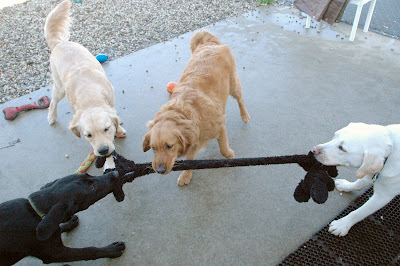 If IKEA can make it work for kids, surely a grocery store can make it work for dogs. Dogs need a whole lot less to make them happy, too. No need for balls or books or blocks. Give mutts an Astroturf surface to run around on, a couple bowls of water, and an attendant with a pooper scooper and a hose. They're happy. And because it would be outside, not inside, the store, the Health Department would be happy. Dog-a-phobes and folks with allergies could use the other entrance; every large grocery store has two these days. I think we should really look into this concept, people! Sure beats trying to shop for crackers with your baby deer getting in the way. For years, a little patch of something that looked like bulbs popped up each spring in a remote corner of my garden. But the plant--whatever it was--never produced any flowers. It struggled mightily: It was too close to an air conditioner, too stuck in a corner to get enough sun, etc. etc. I waited for it, year after year, to gather enough strength to produce a bloom. It never did. So one day last summer, I dug the little pathetic blob up (after the leaves had withered in the sun). I placed the little what-are-they? bulbs in a paper bag in a cool corner of my garage. And then I waited. In January, I popped the bulbs into a pot, covered them up with potting soil, and sent out a prayer to the Garden Fairies. And this year, for the first time ever, my mystery bulbs flowered! They are Narcissus bulbs--with really small blooms, not as big across as my thumb. But they smell just like the drifts of daffodils I remember from the Kansan springs of my childhood. New forays into cooking abound here! I have a lot of free time on my hand here in Cambridge. 3 and a half hours of class a week, 9 essays over the space of 8 weeks, manageable reading....all of this had lead me to find other activities. I read books for my Religious Studies major on my own, listen to a lot of Itunes U lectures and NPR shows, and I cook! I have never been a cook before. At home, I would make pasta, scrambled eggs, toast, and maybe nachos if I was feeling particularly inventive. But real, honest to goodness cooking? I just simply wasn't interested. Well, necessity is the mother of invention, or, in my case, inspiration. Here, with paltry options at a too-far-away dining hall and all this free time, I decided to learn how to cook. I was pushed in the right direction by my lovely mother before coming to Cambridge; she had me follow along with a few of my favorite recipes, and take notes on numerous others. From seeing her cook so often I already had a basic grip on seasoning, measurement, simple cooking techniques, etc., but still had never really put together a meal, from the meal-planning to the grocery shopping to the cooking to the eating, all by myself. Here, I've been loving cooking. I've made three different curries (one even without a recipe! ), beef chili, homemade macaroni and cheese, pan fried salmon, mashed potatoes, balsamic roasted green beans, enchiladas....mmm mmm mmm. I'm learning as I go, but have had a pretty great success rate so far! I make enough for leftovers and then store them away in my isty-bitsy fridge for lunch or dinner the next day. I may not be spending too much time in class here, but I am learning a whole lot of great life skills! This has never happened in this house before. We have a pug who DOESN'T EAT everything he sees on sight! 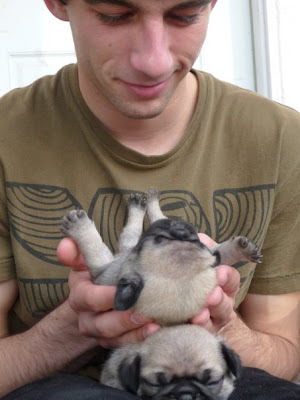 You ARE a pug, aren't you? Google-y eyes, smashed-in face, little black mask? 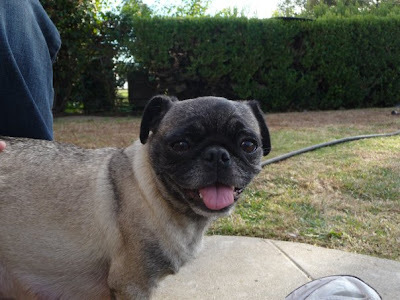 But pugs--at least every pug I've known--has an insatiable drive to EAT! EVERYTHING! IMMEDIATELY! And all you can come up with is, "Do I gotta, man?" "It doesn't SMELL like it wants to be eaten." Maybe after naptime, okay, sport? 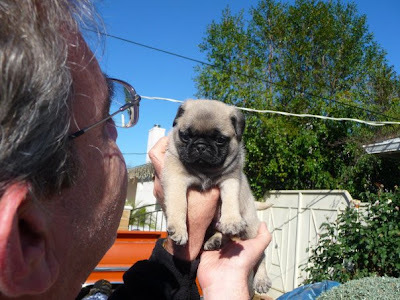 We've Got a Baby Pug! 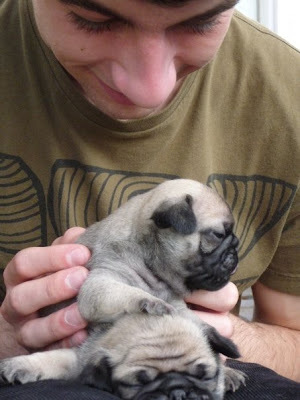 Visiting the pugs was one of the highlights of our January! This little guy and his siblings are proof that you can get a purebred, you can get a puppy, and you can rescue a lovely dog instead of buying into the puppy-mill madness. He's the best Valentine's Day gift, ever!